My work from The Cooper Union Typeface Design Program will be on display at the Type Directors Club in our class exhibition, with an opening reception on Tuesday September 27th from 6–8pm. 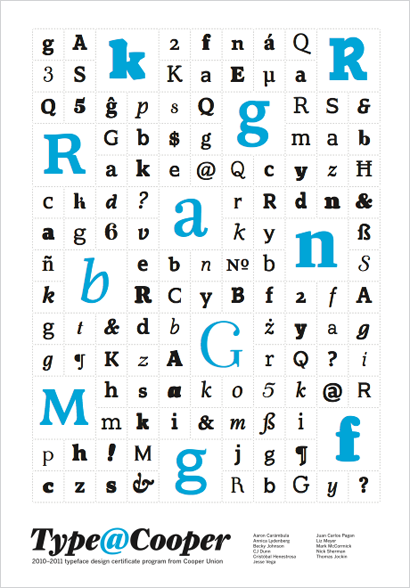 Above is a sample of my original typeface, Range, which will be on display at TDC. My work will be shown in the company of my 10 extremely talented classmates: Aaron Carámbula, Annica Lydenberg, Becky Johnson, Cristóbal Henestrosa, Jesse Vega, Juan Carlos Pagan, Liz Meyer, Mark McCormack, Nick Sherman, and Thomas Jockin. RSVP Free admission to attend, space is limited.